The African Chicken Genetic Gains (ACGG) project aims to integrate gender into its technical research and day-to-day development initiatives. More specifically ACGG undertakes research into how improved chicken breeds impact gender relations and how gender relations impact the adoption these breeds. 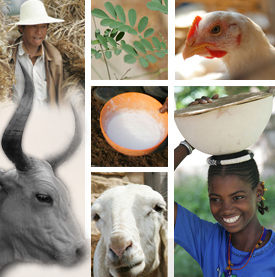 The ultimate aim of the project is to improve the lives of smallholder farmers. A gender strategy for the project been developed with the help of the Royal Tropical Institute (KIT) in the Netherlands, which worked with the ACGG teams in Ethiopia, Nigeria and Tanzania to frame these key gender concepts into a conceptual gender framework. This poster, which was presented at the 7th Multi-Stakeholder Partnership Meeting of the Global Alliance for Sustainable Livestock (GASL) on 11 May 2017 in Addis Ababa, Ethiopia to introduces the common conceptual gender framework. Tags: framework, GASL, poster. Bookmark the permalink.